Now you might remember from my previous postings  that one of my all time favorite subjects at the university was: Programming Languages and their Compilers. This is likely because I had great teachers, as I had the luck to study with prof. Hmeljak and prof. Sipala at the University of Trieste. We followed the path traced by prof Niklaus Wirth, as I believe most European Universities do. We started with the Pascal language, continuing with Modula (II) and on to Oberon following a trajectory from a simple procedural (Algol-like) language to a more structured one, to a most modern object oriented. My first experience writing an actual compiler for such languages was based on Wirth’s book “Algorithms + Data Structures” where, in few chapters, the author manages to present a complete compiler for a subset of Pascal (called PL/0) written in the same language. Unfortunately since I was following an Electronic Engineering rather than a pure Computer Science program, my exposure to the subject remained limited to this one example. At the time I re-wrote the code in C (Borland Turbo-C that was) and attempted to modify the grammar to fit my own personal preferences as I am sure most CS students have done (or dreamed of). 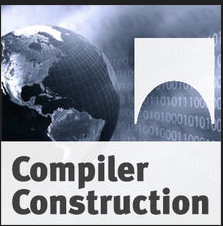 Fast forward a few decades (oops), and here I am looking on iTunesU at the class: “Introduction to Compiler Construction”, presented by prof. Christoph Kirsch, of the University of Salzburg. He teaches using the “Wirth method” and develops an Oberon compiler (based on Oberon-0) as Wirth’s last work: Project Oberon – The Design of an Operating System and Compiler. This was music to my ears! Although Prof. Kirsch was suggesting to his students to use C/C++ to develop the compiler, I could not help but feel the urge to spice things up a bit and follow the project with a small twist: I used Python to develop the simplified Oberon compiler! Here is a [link] to the Github repository containing my new implementation of the simplified Oberon-0 compiler. I learned a lot (about Python and about compiler design) while doing the porting and I will report in a future post more about my experience and my plans for its future evolution… stay tuned! This entry was posted in Languages, Python, Tools and tagged Books, Languages, Open Source, RPython, Swift. Bookmark the permalink.